Lars Pehrsson was born June 28, 1808, in Fröbbestorp, Torsås, Kalmar lan, Småland, Sweden, and died May 4, 1886, in Fröbbestorp, Torsås Parish, Kalmar lan, Småland, Sweden, at age 77. 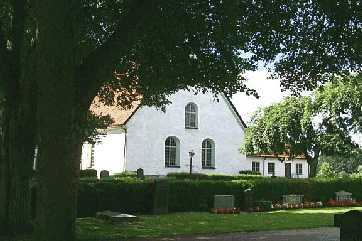 Buried in Fagerhult Kyrkogard, Fagerhult, Högsby kommun, Kalmar län, Sweden. He is the son of Petter Larsson of Fröbbestorp, Torsås, Kalmar lan, Småland, Sweden, and Gertrud Persdotter of Karsbo, Sweden. Christina Olsdotter was born in December 11, 1812, in Glosebo, Sweden, and died January 2, 1856, in Fröbbestorp, Torsås, Kalmar lan, Småland, Sweden, at age 43. 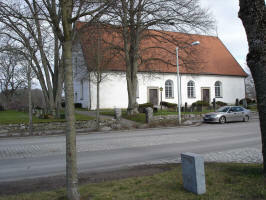 Buried in Fagerhult Kyrkogard, Fagerhult, Högsby kommun, Kalmar län, Sweden. She is the daughter of Olof Andersson of Sodra Stenback, Sweden, and Gertrud Bondesdotter of Stora Glosebo, Sweden. 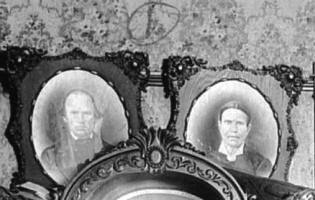 Lars Pehrsson and Christina Olsdotter were married 1832 in Sweden. Ingrid Larsdotter: Born December 15, 1833, in Fröbbestorp, Torsås, Kalmar lan, Småland, Sweden; Died December 3, 1864, in Slätafly, Sweden (age 30). Married about 1856 in Sweden to Sven Petersson: Born September 28, 1831, in S. Slätafly, Sweden; Died November 24, 1909, in S. Slätafly, Sweden (age 78). Peter Larsson Froberg: Born January 20, 1836, in Fröbbestorp, Torsås, Kalmar lan, Småland, Sweden; Died December 3, 1925, in Lyckeby, Sweden (age 91). Married (1) about 1860 in Sweden to Carolina Gustafsson: Born May 21, 1839, in Nättraby, Sweden; Died March 20, 1890, in Karlskrona, Sweden (age 50). Married (2) April 28, 1905, in Sweden to Ingrid Maria Jönsson: Born 1850 in Sweden; Died 1921 in Sweden (about age 71). Andreas Larsson: Born March 5, 1839, in Fröbbestorp, Torsås, Kalmar lan, Småland, Sweden; Died February 10, 1930, in Karsbo, Sweden (age 90). Married October 25, 1867, in Sweden to Anna-Carin Svensdotter: Born October 24, 1838, in Bredavik, Blekinge lan, Sweden; Died May 1, 1905, in Bredavik, Blekinge lan, Sweden (age 66). Magnus Larsson: Born March 24, 1842, in Fröbbestorp, Torsås, Kalmar lan, Småland, Sweden; Died November 10, 1922, in Fröbbestorp, Torsås, Kalmar lan, Småland, Sweden (about age 80). 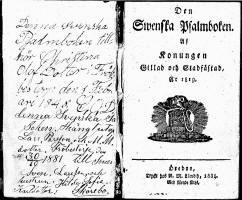 Married November 5, 1873, in Sweden to Ingrid Maria Petersdotter: Born on December 3, 1841, in Labbekulla, Sweden; Died April 21, 1920, in Fröbbestorp, Torsås, Kalmar lan, Småland, Sweden (age 78). Abraham Larsson: Born April 11, 1845, in Fröbbestorp, Torsås, Kalmar lan, Småland, Sweden; Died April 10, 1871, in Fröbbestorp, Torsås, Kalmar lan, Småland, Sweden (age 25). Never married. Gustav Larsson Lewis: Born May 4, 1848, in Fröbbestorp, Torsås, Kalmar lan, Småland, Sweden; Died Sunday May 6, 1934, at the home of his daughter, Menasha, Winnebago Co., WI (age 86). Buried in Lakeside Memorial Park, Waupaca, Waupaca Co., WI. Married March 22, 1876, in March, 1876, in Waupaca, Waupaca Co., WI, to Julianne Marie "Julia" Andersen: Born on June 3, 1858, in Tisvilde, Sjolland, Denmark; Died November 10, 1917, in Waupaca, Waupaca Co., WI (age 59). Buried in Lakeside Memorial Park, Waupaca, Waupaca Co., WI. Olaus Larsson: Born April 23, 1851, in Fröbbestorp, Torsås, Kalmar lan, Småland, Sweden; Died November 11, 1920, in Farmington Twp., Waupaca Co., WI (age 69). Buried in Salem (Old Swede) Cemetery, Farmington Twp., Waupaca Co., WI. Married August 13, 1874, in Marquette, Marquette Co., MI, to Catarina Olivia Wilhelmina Larsdotter: Born January 25, 1848, in Varna Parish, Ostergotland, Sweden; Died August 6, 1906, in Farmington Twp., Waupaca Co., WI (age 58). Buried in Salem (Old Swede) Cemetery, Farmington Twp., Waupaca Co., WI. Erik Larsson: Born November 29, 1853, in Fröbbestorp, Torsås, Kalmar lan, Småland, Sweden; Died May 28, 1906 in Woodland Twp., Yolo Co., CA (age 52). Buried in Plot Block 20, Lot 3, Grave 4, in Woodland Cemetery, Woodland, Yolo Co., CA. Married September 10, 1887, near Dixon, Solano Co., CA, to Mary Sophia Nelson: Born August 6, 1867, in Finland; Died March 10, 1954, in Colusa Memorial Hospital, Colusa, Colusa Co., CA (age 86). Buried in Plot Block 23, Lot 22, Grave 11, in Woodland Cemetery, Woodland, Yolo Co., CA. Christina (Olsdotter) Pehrsson died January 2, 1856, in Fröbbestorp, Torsås, Kalmar lan, Småland, Sweden, at age 43. Following Christina (Olsdotter) Pehrsson's death, Lars Pehrsson married Maria Månsdotter. Maria Månsdotter was born March 12, 1823, in Stuvehyltan, Sweden, and died January 1, 1887, in Fröbbestorp, Torsås, Kalmar lan, Småland, Sweden, at age 63. She is the daughter of Unknown. 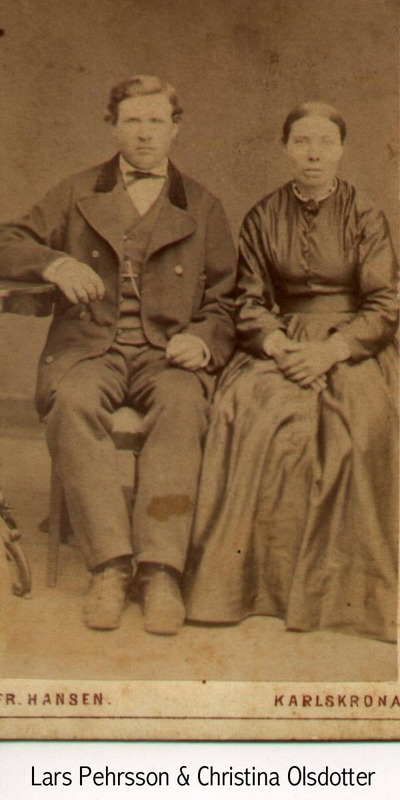 Lars Pehrsson and Maria Månsdotter were married March 23, 1858, in Sweden. Kristina Maria Larsdotter: Born April 29, 1859, in Fröbbestorp, Torsås, Kalmar lan, Småland, Sweden; Died February 17, 1942, in Figgamåla, Sweden (age 82). Married November 24, 1876, in Sweden, to Håkan Petersson: Born October 27, 1849, in Blekinge, Ramdala f., Gåsamåla, Sweden; Died January 27, 1922, in Sweden (age 72). Sven Larsson Freeberg: Born January 24 1861, in Fröbbestorp, Torsås, Kalmar lan, Småland, Sweden; Died January 31, 1924, in Oak Forest, Bremen Twp., Cook Co., IL (age 62). Buried February 5, 1924, in Tinley Park Cemetery, Tinley Park, Bremer Twp., Cook Co., IL. Married about October 30, 1881, in Sweden to Hilda Sofia Karlsdotter: Born May 28, 1863, in Vissefjerda, Kalmar Lan, Smaland, Sweden; Died April 7, 1933, in Miles City, Custer Co., MT (age 69). Buried in Custer County Cemetery, Miles City, Custer Co., MT. Gertrud Larsdotter: Born February 5, 1863, in Fröbbestorp, Torsås, Kalmar lan, Småland, Sweden; Died October 19, 1866, in Fröbbestorp, Torsås, Kalmar lan, Småland, Sweden (age 3). Ingrid Larsdotter: Born January 23, 1865, in Fröbbestorp, Torsås, Kalmar lan, Småland, Sweden; Died January 3, 1958, in Slatafly, Sweden (age 92). Married December 8, 1885, in Sweden to August Svensson: Born July 24, 1856, in Stenbäck, Sweden; Died December 29, 1926, in Karsjö, Sweden (age 70). Lars Pehrsson was born June 28, 1808, in Fröbbestorp, Torsås, Kalmar lan, Småland, Sweden. Christina Olsdotter was born in December 11, 1812, in Glosebo, Sweden. Maria Månsdotter was born March 12, 1823, in Stuvehyltan, Sweden. Lars Pehrsson died May 4, 1886, in Fröbbestorp, Torsås, Kalmar lan, Småland, Sweden, at age 77. Maria (Månsdotter) Pehrsson died January 1, 1887, in Fröbbestorp, Torsås, Kalmar lan, Småland, Sweden, at age 63. 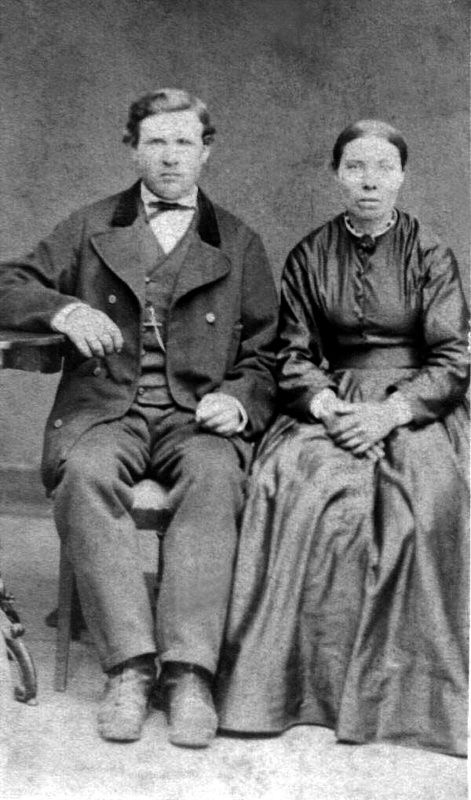 Lars Pehrsson and Maria (Månsdotter) Pehrsson, Karlskrona, Sweden, about 1865. Please note the incorrect identification as Christina. Picture 1, Lars Pehrsson and Maria (Månsdotter) Pehrsson, about 1880-1885. 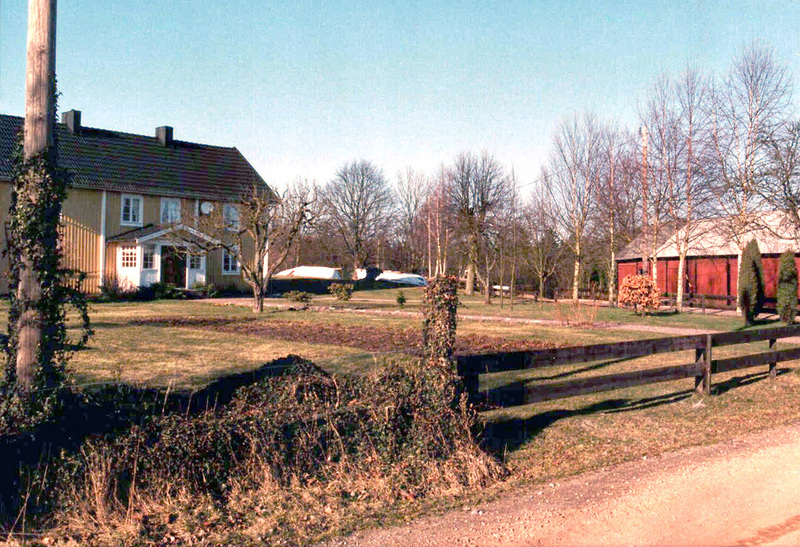 The farm (pictures taken about 1990) where the Larsson children were born. Located in the village of Fröbbestorp, situated south of Torsås, Sweden (population about 7,000). The village consists of four farms. Our first relatives, Per Andersson and his wife Maria Nilsdotter, came to Fröbbestorp in 1691. 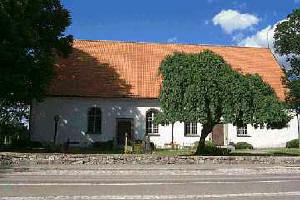 When Per Andersson died in 1722, the farm was taken over by one of his sons, Anders Persson (1707-1785). Anders Persson had several children. Two of them, Per Andersson (1738-1790) and Lars Andersson (1746-1798), stayed in Fröbbestorp. The farm was split in two pieces...one piece to Per Andersson and the other piece to Lars Andersson. Per Andersson was succeeded by his daughter and his son-in-law. When they became too old to work the farm, they were succeeded by their son Nils Olofsson (1811-1879). His offspring still owns the farm. Lars Andersson married Ingrid Nilsdotter (1754-1823). They had many children. The oldest son, Petter (sometimes he used the name Per) Larsson (1779-1821), took over the farm. He died at only 42 years old, and his widow then married Sven Larsson. Denna svenska Psalmboken tillhör Christina Olof Dotter i Fröbbestorp den 1 Februari 1848. C O D.
Denna Svenska salmboken skängt utaf Lars Pärsson ock M. M. dotter Fröbestorp den 30/10 1881 till sonen Sven Larsson och hustrun Hilda Sofia Karlsdotter Skörebo. 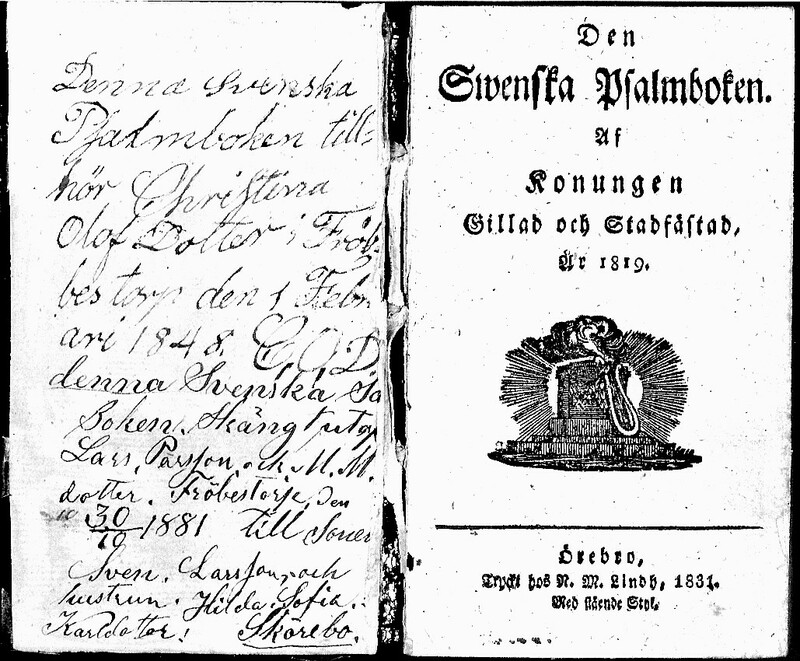 This Swedish hymn book belongs to Christina Olof Dotter in Fröbbestorp the 1st of February 1848. C O D.
This Swedish hymn book was given by Lars Pärsson and M. M. dotter Fröbestorp 30/10 1881 to the son Sven Larsson and the wife Hilda Sofia Karlsdotter Skörebo. Christina Olsdotter's Hymn Book, courtesy of Per Carlzon. Sven Larsson Freeberg’s grandson, Donald “Don” Cain, owned the book at his death. Shown below is a translation of the estate inventories after (our ancestor) Lars Pehrsson. There are about 10 items that are not mentioned and the explanation is quite simple. I wasn’t able to translate them from Swedish to English. The Swedish estate inventories from that period was very detailed and in the beginning the house where Lars Pehrsson spent his last years is also described: 1 dwelling house equipped to 2 rooms, hall, kitchen and attic covered with tile. I guess Lars Pehrsson moved to a smaller house on the same farm when he was too old for being a farmer and his son, Magnus Larsson, had succeeded him as the owner of the farm. Since your ancestor, Olaus Larsson, lived in USA and therefore didn’t attend the estate inventory (in October 1886) he was represented by his brother, Peter Larsson Fröberg. Lars Pehrsson was 77 years old, which was a respectable age at this time. He had gone through many tragedies and happy moments as well. When he was a little kid he had small poxes. His younger sister, Stina, was also struck with the same disease. Their younger siblings, Cajsa and Olof, were given vaccine. The four siblings all became adults and got many children. I hope you can have some interest and use of the translated text about your ancestor. BEDDING AND LINEN: 1 stitched quilt, 2 feather beds, 3 cushions, 3 hair quilts, 5 ½ sheets, 3 tablecloths, 4 serviettes, 5 towels, 6 pair of curtains, 6 blinds. GLASS AND CHINA: 4 shot glasses, 2 drinking glasses, 2 vodka bottles, 2 carafes, 3 deep dishes, 5 plates, 3 coffee cups, 2 saltcellars and 1 coffee pot. In Fröbbestorp, Magnus Larsson was succeeded by his son Karl Oskar Magnusson (b.1874). But he was the last relative in a direct line from Per Andersson (who bought the farm in 1691) to cultivate the farm. Two of his children became farmers in another village, another son worked as a taxi driver and the daughter (who is still alive) owned a motel. But this is not the end of the story, because several years later another relative came back and cultivate the farm. It was an offspring of Maria Larsdotter (b.1786) - sister of Petter Larsson, whose name is Bertil Johansson. So today there are still two farms in Fröbbestorp owned by relatives: the farm owned by Per Andersson (1738-1790), and the one owned by Lars Andersson. A description of Fröbbestorp from 1571 until today. Our common ancestor, Lars Pehrsson, was mentioned in the text. Fröbbestorp was full of relatives. 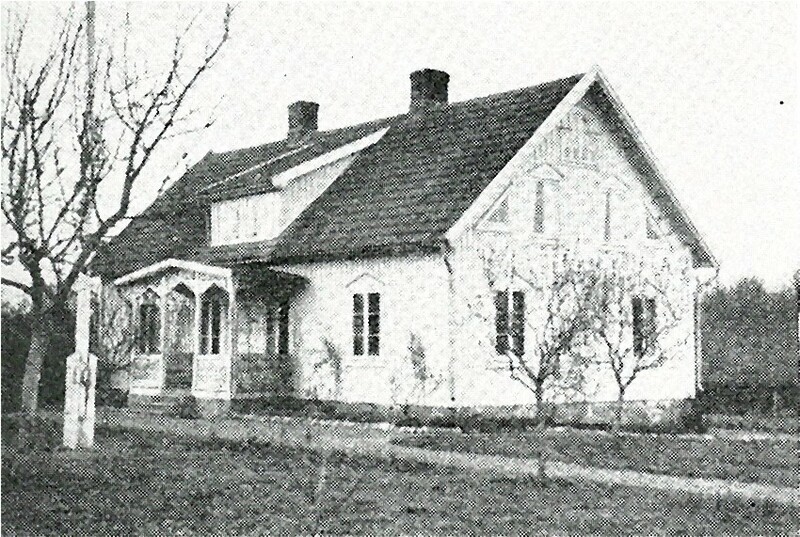 Lars Pehrsson's second cousin, Nils Olsson, owned a farm in Fröbbestorp. Lars Pehrsson had a second cousin, Petter Svensson, who was a crofter in Fröbbestorp, but seemed to have moved out from the village in the early 1840's. Nils Olsson was also married to Stina. She was born in Juansbo, the same village where Lars Pehrsson's grandmother, Ingrid Nilsdotter, was born. Stina was related to Ingrid Nilsdotter. So Lars Pehrsson was related to both Nils and Stina, as well as the crofter Petter Svensson. The owners of Nils' farm in Fröbbestorp haven't been followed, but a theory goes like this. Nils' had a daughter, born in 1837. She was married to Sven Larsson. They had at least two daughters, Stina and Gärda. Stina was married to August Nilsson. They had many children, among them a daughter, Anna, born in 1892. In 1920 she was married to Samuel Nilsson b. 1887. Anna died in 1983, but Samuel got the opportunity to celebrate his 100th birthday anniversary. Another thing from the folder. 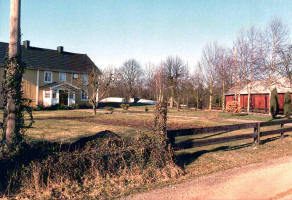 In 1858, Lars Pehrsson's farm was the largest in the village. Maybe with one exception, because the figure for the fourth farm wasn't mentioned. Lars Pehrsson's farm's size was 147 acres. The other farms were on 146 and 141 acres. According to the text, cattle breeding was the main income for the village. But more will come when the folder becomes available. Farms in Torsås and Gullabo and other parishes. Our ancestor Karin Olufsdotter was born In the village of Kulebo in 1714. She was Lars Pehrsson's maternal great-grandmother. Of course the houses have changed a little bit since then. Karin was married to Per Bondesson in Karsbo and moved there. Her brother Börge Olufsson, b.1710, took over the farm. After him came his son, Olof Börgesson, b. 1749. Then the farm was split in to two pieces, between his sons, Olof and Lars. Olof Olsson was married to Brita Persdotter, but had no children. So his part was taken over by his niece, Ingrid Börjesdotter, f.1819, (daughter of Lars and Olof's brother Börje). Ingrid was married with Petter Andersson and the couple cultivated the farm between around 1850 to 1875, when their son-in-law Nils Pettersson took over (he was married to Petter and Ingrid's daughter Kristina). 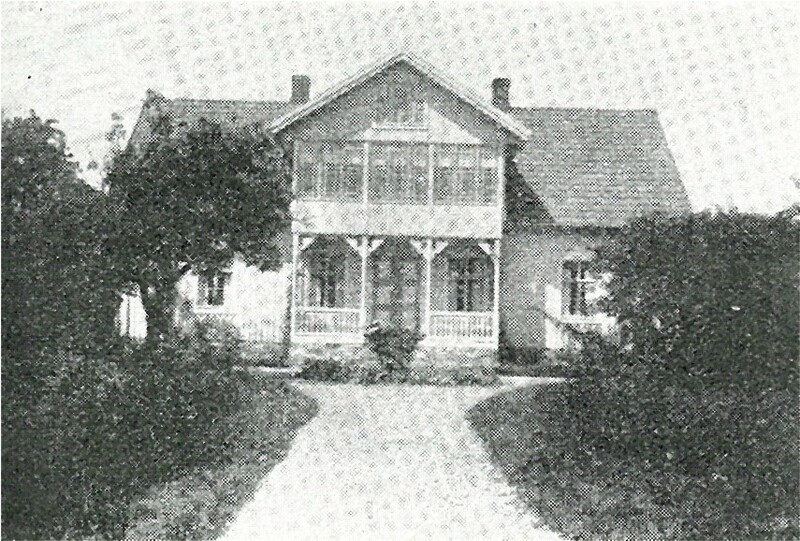 Nils Pettersson cultivated the farm until 1907, when Nils and Kristina's son, Per Alrik Nilsson, b. 1875 and his wife, Tilda Andersson, took over. They were married in 1907 and had three children; Edit b.1909, Sture b.1913 and Axel 1916. I am not sure but I think Axel is father to Staffan Axelsson. Staffan Axelsson lives in Kulebo today and is founder and managing director for an construction firm called, Mörebygg. His house looks more like an palace today. If my assumptions are correct Olaus Larsson was fourth cousin with Staffan Axelsson's greatgrandmother, Kristina. Then we have Lars Olsson's farm in Kulebo. He was married with Christina Olofsdotter. But the marriage didn't last for long. She died in an tragic accident. Together with a couple of people Christina drowned on June 27, 1830. In around 1860 Lars Olsson was succeeded by his son, Anders Larsson. The next generation was Anders Larsson's son, Elof Andersson. After him came his son-in-law John Fridolf Gustafsson, b.1898, married in 1936 with Märta Elofsson (daugther to Elof Andersson) and they had at least one child; Göran Ingvar b. 1937. In the text it says that "Staffan's farm" is on 70 hectares and that the farmhouse was built in 1888. "Göran Ingvar's farm" is on 65 hectares and the farmhouse was built in 1889. Karin Olufsdotter's father Oluf Persson was born in Juanslycke as his father, Per Olufsson. Per Olufsson's father was Oluf Nilsson. According to Tomas Alriksson, he was hit with a stone by Sven Svensson in Qvarnagården. This incident must have happened around 1663. Sources: Svenska Gods och Gårdar (1939), and Tomas Alriksson. I have added some information regarding our relative in Africa. Her name was Vanette Thorsell and her great grandfather, Peter, was the uncle of Olaus Larsson. 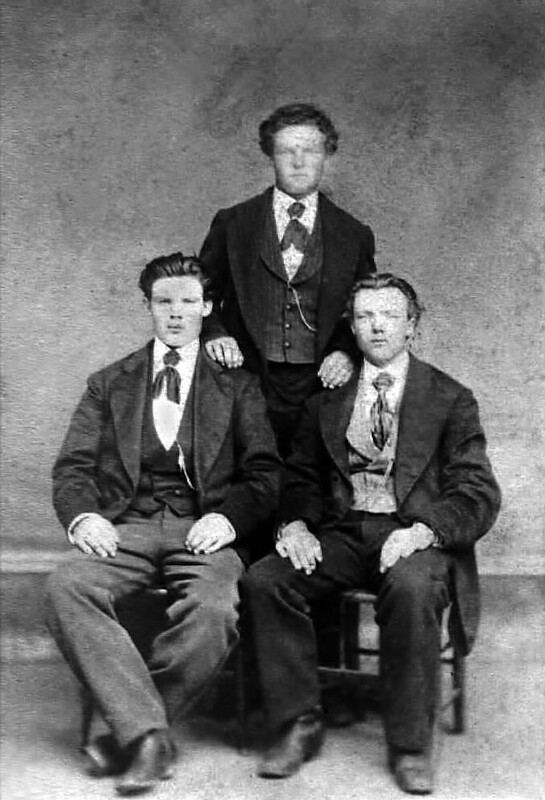 Peter was vaccinated in the 1810's. Sweden was if not the first, at least one of the first countries in the world that give the population an extended vaccination. Almost every little child in the 1810's and after went through this process. But it didn't help Peter from getting another diseases. He later was "crippled with rheumatism". Olaus Larsson's father, Lars, got small poxes. One of Lars' sister, either Cajsa or Stina, also had small poxes. But she survived as well. Peter became a peasant and got many children. One of them, Petter, was a school teacher and changed his last name from Petersson to Thorsell. Petter Thorsell also had many children of whom four moved to USA and settled down there. Klaes (Charles) Thorsell had - as to the best of my knowledge - two children; Vanette and Stanley. Vanette Thorsell appears to have lived an exciting and dangerous life, since Congo/Zaire for decades has been affected by civil war and dictatorship. It was most likely not a bed of roses. When our ancestors Per Andersson and Maria Nilsdotter arrived and settled down in Fröbbestorp in 1691 it was during a peace period in the Swedish history. Sweden had been involved in several wars that century. There was however a severe famine. Uneven weather was a major contributing factor. In 1695 was the Summer cold. The Autumn frost came early. In many places before an unusually late harvest had been salvaged. The crop failure was already a fact. The weather then switched to a mild autumn and the beginning of the winter was also warm. Fresh grass grew a finger’s length in the beginning of February. Trees and shrubs buds themselves and the Autumn sowing began to germinate. Then the cold and snow came. The Spring was exceptionally late and the Summer was extremely cold. The late Summer of 1696 was visited by night frost. In many places were the majority of the fields fallow, since the starving population, the winter before, was forced to eat most of the seeds. Strawberries ripened only in September and raspberries in October. The harvest, in the places the crop matured at all, was of course disastrous. The winter that followed was severe and even in 1697, the Spring came very late. Winter cold was in some places so severe that it even was difficult to remove the bark from trees to make bark bread. Worst hit was northern Sweden. Its estimated that 100 000 died as a result. The failure of crops was a perennial scourge. There were small margins in the Swedish peasant society. The population rebounded, however, surprisingly fast. Between 1697 and 1708 the harvest seems to have been fairly good. To pay for the war that began in 1700 the Swedish crown gave the farmers the opportunity to buy their farms. Per and Maria accepted the offer. But tell the happiness that lasts. 1708-1709 another failure of crops arrived. It was followed (1710-1712) by a very serious plague. Many of our ancestors died. 1/3 of Stockholm’s population died in the plague. Then occurred a few years of good harvests. However, it was only the calm before the storm. For in the year of 1716 the crop was shaken by hard rain, followed by two years of distinct crop failure. In 1721 the peace came and also some years that were beneficial to the farmers. More and more farmers had enough money to buy their farms. There were low rates of mortality, peace, mild winters and good harvests. Those who survived the war years were relatively immune to epidemics and perhaps even unusually viable at all. There were, moreover, plenty of uncultivated land. But then the situation once again changed. In the 1730’s the mortality rate rose sharply, due to international epidemics and several bad harvests. Between 1741 and 1743 Sweden was once again in war with Russia. Southern Sweden was not affected by any direct acts of war. But in 1741 the dysentery hit with devastating force. Hundreds of people died in “our” area. The cold winter was a significant factor. The heating was by modern concepts flawed and mortality was significantly higher in winter than summer. Especially devastating was the late winter and early spring strong temperature fluctuations that often broke the old and sick people. The winters were generally cold and long, until the 1800s. The second half of the 1700s also named the Little Ice Age. 20% of all children died during the first year of life. In 1756 there was a widespread crop failure caused by extreme cold. New crop failures occurred in 1781 and 1783. They were caused by a combination of heat and cold. The Summers were exceptionally hot and dry, but in 1783 even the Winter was cold and the Spring came very late. In some parts of northern Sweden the snow remained well into June and it wasn't possible sowing before midsummer. The harvest had no time to mature before Autumn arrived. The winter feed had ended long before the new grass came up. As a last resort some farmers were forced to feed their cattle with roof straw. The Swedish agriculture gradually became less and less sensitive to climate fluctuations and weather changes. Through land reclamations of forested areas, extensive clearing of stony soils and drainage of waterlogged land the cultivable area in the country increased. Technological advances further increased the production and the potato was also introduced. On a whole the production of cereals moved from deficit to surplus. In the 1790’s the climate was very warm. But it changed. In 1799 and 1800 the Spring became many degrees cooler than normal. 1800’s and 1810’s were extremely cold. 1812 and 1814 were the worst years. The last time when the failure of crops arrived with devastating force was in 1867-1869. Our ancestor Lars Pehrsson and his family in Fröbbestorp however survived. But many Swedes weren’t that fortunate. Per Andersson was, as was the custom, by his oldest son, Anders Persson. Per Andersson died in 1722. The son was only 14 years old. Probably the mother, Maria, who came to live with the son and his family, assisted in the day-to-day running of the farm. Anders Persson married Anna Olufsdotter and got ten children. Four of them died before the age of 5. The oldest sons (Per b.1738 and Lars b.1746) divided the farm, maybe, in the late 1760’s. 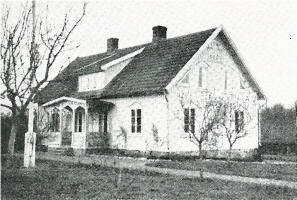 Both sons had families and continued to stay and cultivate their farms in Fröbbestorp. On August 29, 1798, Lars Andersson died of diarrhea and was succeeded by his oldest son, Petter Larsson. He married Gertrud Persdotter and they got seven children. Five became adults. On December 4, 1821, Petter Larsson died of pneumonia. His widow remarried Sven Larsson. When Petter’s and Gertrud’s oldest son, Lars, was old enough to take over the farm the mother and the stepfather moved from Fröbbestorp. It happened in the early 1830’s. Lars and Christina had eight children. But in 1856 Christina died. In 1858 Lars married Maria and they received four children. The family was devoted Lutherans. They frequently took part in the holy communion. Lars Pehrsson was suceeded by one of his son’s (not the oldest however) Magnus Larsson in the 1860’s or 1870’s. Magnus Larsson was succeeded by his son, Karl Oskar Magnusson, who ran the farm until 1931 when he sold it and moved to another village and farm. Then between 1931 and 1968 there were other owners. 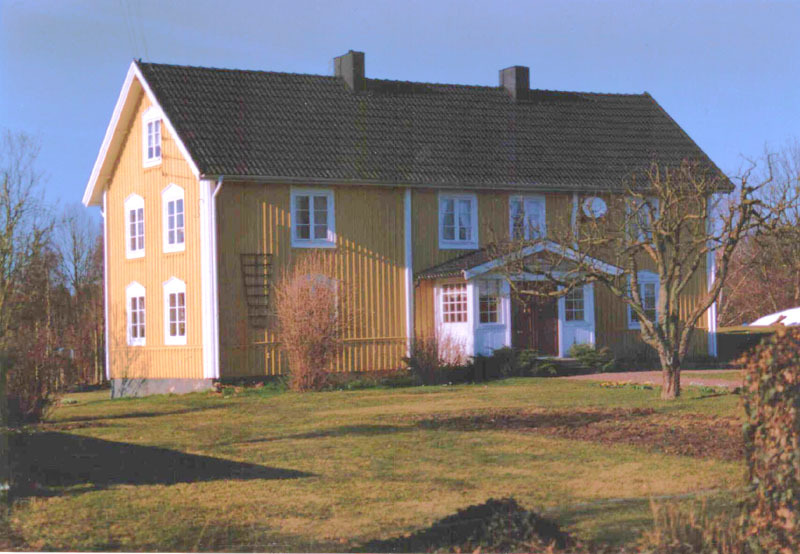 In 1968 the couple Bertil and Anna Lisa Johansson, actually descendants of Lars Pehrsson’s aunt Maria Larsdotter, bought the farm. They gave the farms to their four children; Jan-Erik, Lena, Lillemo and Bengt. Today Jan-Erik’s son Jens owns and lives on the farm. In other words it’s in the family. Hopefully you can put in your ancestors in their historical context.